Rick Harder: This is not where we live. The Plummer Mansion is near our home while we're here. 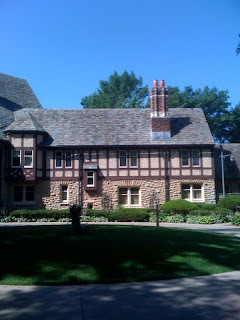 It was built by one of the main doctors in the early days of The Mayo Clinic. Jeanine and Ed take long walks every day and go by this house. It's in the "Pill Hill" neighborhood. The area looks like Portland's East Moreland, Eugene's University Street and The Pittock Mansion. Cool.